Last Friday’s event entitled “How Stanford Works” tackled issues related to the University’s processes for enacting campus-wide policy changes. The program is the first installation of the Institutional Change at Stanford series hosted by Lily Zheng ’17 in collaboration with the ASSU. Dereca Blackmon speaks at workshop (MELISSA SANTOS/The Stanford Daily). Zheng started Institutional Change at Stanford last year as a way of making Stanford’s administrative decision-making processes more transparent to the general student body. In the event’s opening speech, Zheng detailed how her perception of Stanford has evolved over the last four years and how she came to understand how “complex and nuanced” the University is. Zheng said that as a freshman it did not even occur to her that Stanford was an institution; back then, she believed Stanford was a “heaven on earth” with “free shuttles and amazing food.” However, she remarked that her opinion of the University slowly changed over the years. During the rise of the Black Lives Matter movement in 2014, Zheng says that she and her peers became “the most politically active class” that Stanford had seen in a decade, holding demonstrations on campus and even blocking off the intersection of El Camino Real and Page Mill Road in Palo Alto. During her junior year, Zheng and 67 other students took their protests against racial injustice a step further: they blocked traffic on the San Mateo Bridge. But according to Zheng, the University failed to respond to her and her fellow classmates’ arrest and left her feeling disillusioned as she stepped back from activism. During her senior year, Zheng was surprised to find new signage on the bathrooms in the Women’s Community Center: bathrooms were now labeled “gender inclusive.” When she asked a staff member about the new signs, she was told she had in fact played a big part in making them into a reality. Zheng said she was shocked. “I said, ‘What? No! I don’t remember doing any of this. Alright, I was busy getting arrested!’” she said. Over the following weeks, Zheng witnessed additional gender inclusive signs added to Old Union, student residences and other buildings around campus. After contacting University representatives, she discovered that former provost John Etchemendy had recommended a small student committee be formed to help plan, budget and implement all-gender bathrooms on Stanford’s campus. According to Zheng, seeing the effects of her activism helped make her more aware of the process of institutional change on Stanford’s campus. “Institutional change was not loud, it was not flashy, it was not dramatic. I don’t remember holding a single protest to do this, and yet I was humbled by how effectively this institutional change happened right under my nose,” Zheng said. Zheng concluded by saying that institutional change has to be the result of long-term collaboration between people both inside and outside Stanford’s institution, from students and faculty to the administration and local community. Following Zheng’s opening speech, various administrators and student representatives came forth to give short addresses and hold Q&A sessions with the audience. Philip Taubman ’70, secretary of the Board of Trustees, spoke about students’ prominent role in banning classified war research on Stanford’s campus during the 1960s Vietnam War era. Current students Remy Gordon ’20 and Hamzeh Daoud ’20 also spoke on behalf of the Undergraduate Senate. According to Gordon and Daoud, campus change takes place in many ways — via shifts in policy, organizational restructuring and cultural modification. 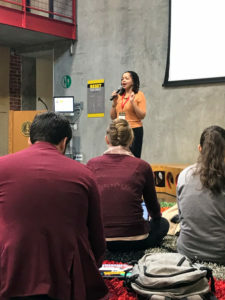 They advised students to empower themselves by taking part in institutional change processes at Stanford — a good starting point, they said, would be to attend events like these to simply become more informed. The event also featured an informational video about Stanford’s administrative structure. The video, created by Vice Provost for Academic Affairs Stephanie Kalfayan, provides viewers with an in-depth history of Stanford’s development as an institution. Audience member Kevin Ji ’21 said he found the video particularly helpful. Associate Dean and Director of the Diversity and First-Gen Office Dereca Blackmon ’91 also spoke at the event about her own experience as an FLI undergraduate at Stanford who faced homelessness and spearheaded a movement to change the University’s core curriculum to be more inclusive of non-Western cultures. Blackmon went on to say that she felt misguided at the time given that the success she and her peers experienced happened as a result of years of prior struggle. For students interested in further exploring Stanford’s institutional processes, the second installation of the Institutional Change at Stanford series, “Making Change Happen,” will take place this Saturday, Feb. 3. The program will allow students to work directly with University leadership and experts on current issues that Stanford has yet to tackle, such as the University’s response to sexual assault and efforts to increase diversity and inclusivity.